Now I'm back living in New Zealand, I should really post some New Zealand stuff huh? Well, here's this, the first trailer to the second Hobbit film, The Hobbit: The Desolation of Smaug. 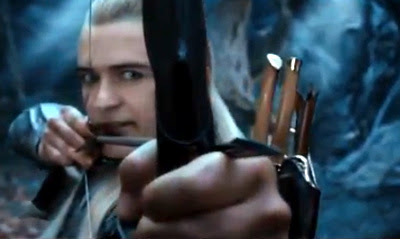 Sure we see Smaug's head at last, but better in my books we also see Legolas retroactively for the first time, because God knows there hasn't been a movie made that isn't better without an archer in it. Sorry, but my country looks frickin' awesome in these films doesn't it? Well some parts are CGI, but perhaps not all the ones you think. ARGH. I wanted to hear Smaug talk!! But I got to see the barrel roll, and that's one of my favorite parts too. Was I imagining it, or was Orlando Bloom playing a human part too? It looks gorgeous. I always wanted to visit New Zealand, even before TLOTR came out. But it definitely added appeal knowing some of that topography really existed on the planet. And it's accessible by plane. A lot of it is even accesible by road Random. I'm about two hours drive from Hobbitville and the same distance south takes you to Mount Doom. Come over and I'll show you! aS FOR Bloom playing two roles, I'm thinking he might be too. Plus from the trailer I'm really liking his female elf companion. I know she's not in the book and one of the additions Jackson made to stop the Hobbit films being to male-centric, but she has the best line in the trailer to me! That was a very cool line. I'm putting myself on a Tolkein ban until all these movies have been watched and categorized on their own basis. As much as that's possible. Because after I saw the first Hobbit movie it took me three repeated viewings before I could watch it without being shushed by everyone in the room. Man, I really wish I was independently wealthy. We'd have a convention. I was like that in X-Men. Someone I went with didn't get why Rouge couldn't just break free of Magneto's handcuffs, sock Sabretooth in the mouth and fly away. So I tried to briefly explain Ms Marvel's role in Rouge's powers. Shushes followed and people missed a few on screen seconds of Wolverine. Chaos. Heeheehee. That happened to me watching Watchmen. I was trying to explain why it should have been a giant monster, and the ensuing plotline about disappearing writers...yeah. Great backstory, but a lot of people their just wanted to watch the flick. Thanks for that Anon - it sure would be handy having a almost identical twin of me walking around at times, movie star or not!